In 1912 A. C. Bollinger and Dr. N.B. Pautler, together with a group of Waterloo businessmen and farmers, obtained a charter for the First National Bank of Waterloo. The first Board of directors included Bollinger, Pautler, H.C. Voris, John J. Koenigsmark, Ernst W. Loehr, A.C. Rexroth, Thomas Ruch, and Louis Stumpf. 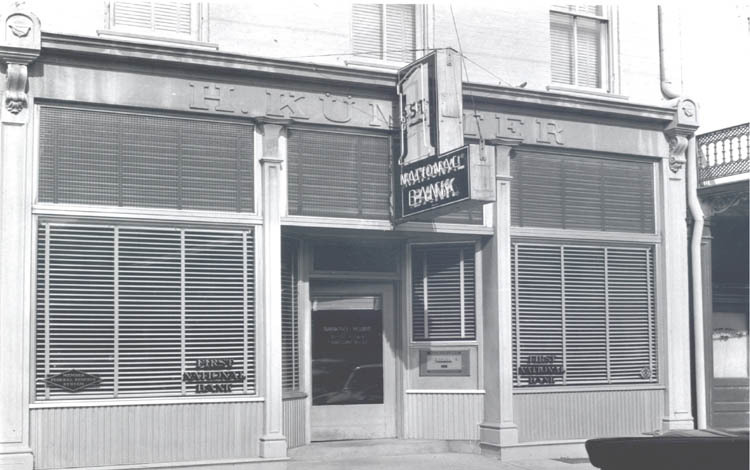 Thus began the First National Bank of Waterloo with total deposits of $26,625. Today First National Bank has total assets of approximately $480 million. The bank has always been a leader in the banking community with a dedicated staff and Board of Directors. The current Board of Directors includes: Tyler E. Dinkelaker, Lee Eggmeyer, Gary D. Hemmer, Robert A. Hoffmann, Alice M. Jost, Dennis W. Lutz (great-grandson of A.C. Rexroth), David A. Mehrmann, Daniel C. Nester, George W. Obernagel, John N. Richards and George P. Ziebold. William Gardner serves as Director Emeritus. The tradition started in 1912 continues today. First National Bank is still locally owned and dedicated to providing financial support for our community’s progress, building one-on-one relationships with our customers and committing time and leadership to local civic and charitable organizations.